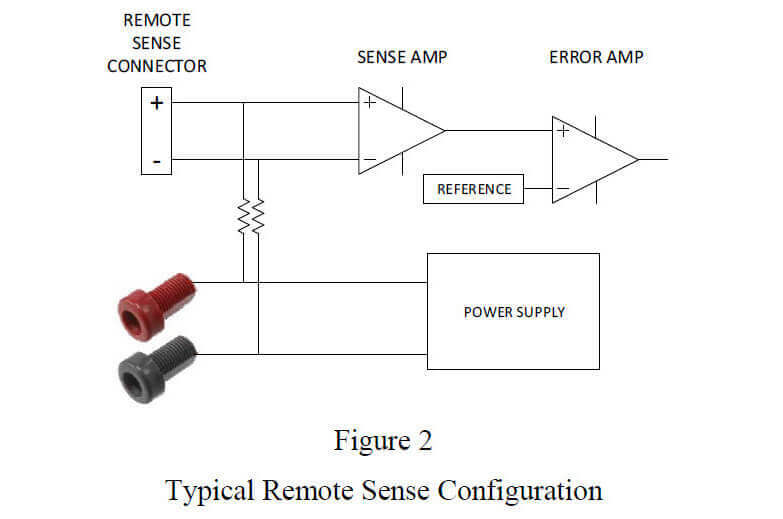 Remote sense, a common feature on test and measurement power supplies, allows the user to correct for the drop in voltage in the wires connected between the power supply and the load. This is an important feature as it is the best way to assure that the voltage specified is the voltage you will actually get at the load. 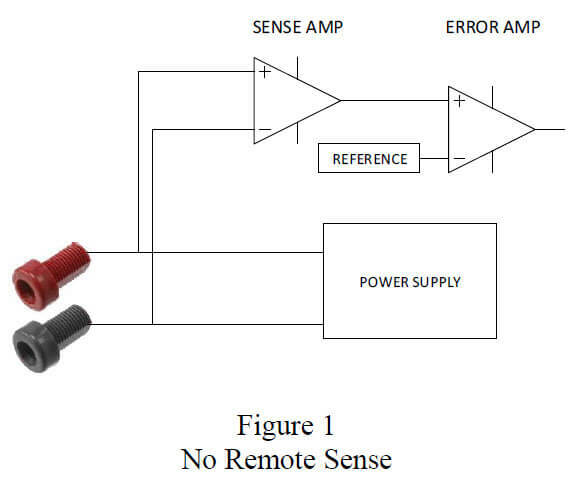 Without remote sense the output of the power supply may be accurate, but by the time the voltage reaches the load the voltage drops in the distribution wiring which will cause voltage errors. The typical solution for improving monitoring and regulation of the power at the load involves adding extra wires for remote sensing. How Does Remote Sense Work? Typically, a power supply will sense the voltage output at a point very close to the output terminals and cause the voltage at that sense point to be accurately regulated. Figure 1. Illustrates the sensing arrangement typically used in a bench power supply without remote sense capability. In this example the sense amplifier only senses the output at the connector terminals of the power supply. A power supply with basic remote sense includes a connector to attach a pair of wires that originate out at your load and then terminate right at the sense amplifier. A small value resistor is added in series with the sense lines that go directly to the output of the power supply. This resistor allows the remote sense signal from the connector to override the signal from the output terminals, so long as the resistance in the sense wires is significantly less than the series resistors while also automatically connecting the sense amplifier to the output if no remote sense wires are connected to the load. 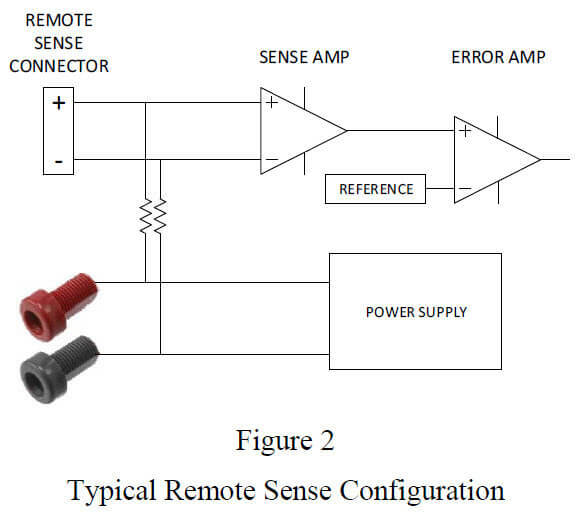 Figure 2 illustrates a Typical Remote Sense configuration. While this remote sense technique is widely used it has some serious drawbacks that limit its usefulness and accuracy. In addition, there can be failure mechanisms associated with this topology that frequently occur. Let’s discuss noise issues first. With the basic remote sense scheme you are required to run a second set of leads to the load. A common problem with the sense leads is that they are long and prone to picking up noise from the environment. As the leads end up going to the sense amplifier that is used for feedback for controlling the power supply, any noise picked up by the sense leads will be amplified by the power supply and will show up as much more noise on the output. This can result in just a noisy output, oscillation of the power supply, or even failure of the power supply. Significant care must be taken with the sense leads to avoid noise sources. Frequently even the output leads of the power supply itself must be avoided to eliminate problems. This is the reason that small value resistors are typically used between the remote sense connector and the output. If large value resistors were used, the input impedance of the remote sense would be so high that the noise problem would be insurmountable. Unfortunately, the resistors cannot be made so small that there is no noise problem due to ground loop issues. In some cases additional shielding of the remote sense wires is required in high noise environments. Many power supply companies have had ongoing customer complaint issues and power supply failures that eventually were tracked to injected noise issues. A second serious issue with the basic remote sense scheme is the possibility of ground loops. Any power supply and particularly high-current power supplies can create a significant voltage drop in the wires connecting the output of the power supply to the load. This is the reason remote sensing exists. Unfortunately, should the leads to the load be undersized, or become accidentally disconnected, damage to the power supply internal remote sense circuit can result. This occurs because any drop across the load wires is reflected across the two series resistors that are necessary in the sense circuit. Should either load wire momentarily open or should the drop in the load wires be sufficient, the sense resistors will conduct enough current to cause them to fail. This is a frequent cause for the return and repair of many power supplies. Most of the test and measurement power supplies on the market today are designed with analog control loops. Many have digital front panels and digital interfaces for the user but the actual control of the power supply is still done with analog circuits. 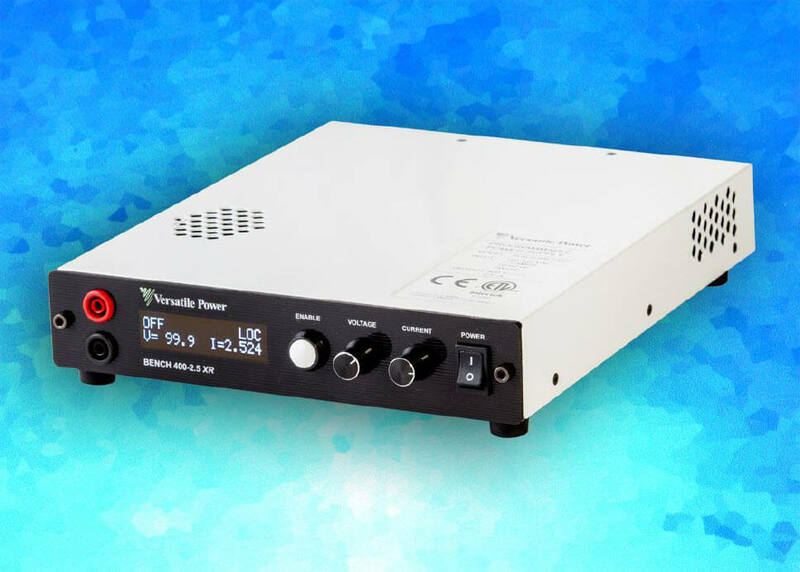 Versatile Power’s family of BENCH power supplies is designed with full digital control. Digital control allows the user to control the power supply in many ways that are just not possible with an analog control loop. The control loop can be changed in real time, for instance, to accommodate many types of loads. Power supply performance can also be easily tailored to meet a particular customer’s needs. In the case of remote sense, this digital control can eliminate all of the problems discussed above and provides additional benefits. With Versatile Power’s (patent pending) wireless remote sense no leads are required other than the power leads to the load. This eliminates the need for the user to add extra noise-sensitive wires to the system and simplifies installation. The wireless remote sense is just as accurate as wired remote sense. This is all accomplished by sensing the load current and determining the resistance of the leads to the load. Once this data is known then ohms law can be used to determine the voltage needed on the output of the power supply in order to get the proper voltage on the load. In the BENCH digitally controlled power supply, the system is able to sense the output current and recalculate the output voltage requirement at the switching frequency of the power supply. This means that the wireless remote sense can respond to variations in the load current much much faster than a wired remote sense scheme can. Setup is very easy. First, the user connects the load to the power supply through whatever wires he chooses. Second, the user shorts the power supply output at the load. Last, using the front panel (or through the digital interface) the user tells the BENCH XR power supply to calibrate the load resistance. With this done the short is removed from the load and the power supply will automatically compensate for any load variation. There is no possibility of picking up noise from sense wires. There is no possible ground loop. Also there is no limit to the amount of load wire compensation voltage as there are no sense resistors that can be damaged. With the introduction of Versatile Power’s BENCH power supply’s wireless remote sense there is no longer a need to add the extra wires for wire remote sense, risk the problems of injected noise, or the problems with ground loops. Very accurate, very fast regulation can be had at your load with no wires and a simple one-time setup.